Lombok is a fantastic time saver, but it can be troublesome to use with Java 10. Let's work through the problems to get it working. In this post, we will take a look at Project Lombok and what it has to offer us. Project Lombok reduces boilerplate code by making use of annotations in your code. The main advantage is achieved with POJOs (Plain Old Java Objects): You don't have to code getters and setters anymore. Although your IDE provides the possibility to generate getters and setters, with Project Lombok, you also don't have to read them anymore. The source code used in this post can be found at GitHub. Let's start by creating a Maven project. I am using IntelliJ IDEA Community Edition 2018.1 for this and will make use of Java 10. I am using Java 10 in order to see whether we can already make use of Project Lombok with Java 10. So far, so good, except that IntelliJ keeps complaining that module lombok cannot be found. Restarting IntelliJ did not solve the problem. It seems that Project Lombok is not yet ready to be used with Java Modules and it is better to wait until all the issues are resolved and the edge version is officially released. In order to continue, we will disable the module-info.java by renaming it to module-info.java_. Besides this, it seems that there are also Java 10-related issues with Lombok. In order to finalize the installation, it is also necessary to enable annotation processing in IntelliJ. Go to 'File - Settings... - Build, Execution, Deployment - Compiler - Annotation Processors' and check 'Enable annotation processing'. Now let's see what Lombok has to offer us. 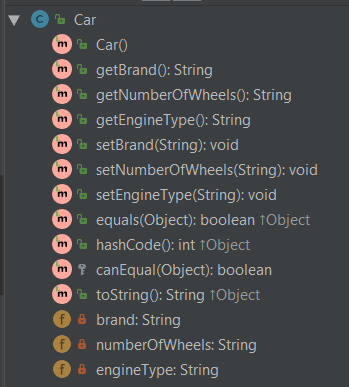 We create a Car POJO with some String attributes. Normally seen, we are going to create the getters and setters by means of our IDE. The disadvantage of this approach is that a lot of boilerplate code is created which we inevitably will read. And here Lombok comes to the rescue! We import lombok.Data and add the @Data annotation to the POJO. Let's take a look at some other useful Lombok annotations. First, we create a CarOther POJO. Instead of using the @Data annotation, we use the @Getter in order to generate only the getter for the specified attribute and we use the @Setter in order to generate only the setter for the specified attribute. This gives us the opportunity to differentiate for which attributes getters and setters are created. 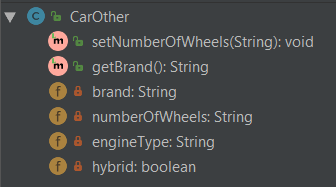 In IntelliJ, we see that only setNumberOfWheels and getBrand are generated by Lombok. By means of the ToString annotation, it is possible to restrict which attributes are shown in the toString method. We can do so by defining which attributes need to be excluded from the toString method. In the example below, we exclude engineType and hybrid. A complete list with generated Java code can be found at the Lombok website. Wouldn't it be great when the Lombok annotations made it to standard Java? Yes it would, but it doesn't seem to be happening in the near future. The creators of Lombok have already tried to insert far less ambitious changes into Java and are quite disappointed with that experience. The responses can be found at https://github.com/rzwitserloot/lombok/issues/1312 and at https://groups.google.com/forum/#!topic/project-lombok/6sggfRp0PUY . So, for the time being, you will need to include Lombok in your project when you want to use it. In this post, we have shown how you can use Project Lombok with Java 10, which is not yet very easy to do. My advice is to use Java 8 when using Project Lombok up to the moment that the edge version has become a stable release. If you do insist on using Java 10, then you will need to use the edge version, but disable Java Modules because of the issues with it. We also have taken a look at some features that can be easily applied to your daily work and will speed up development and reduce boilerplate code.